Our quest for simplicity, both external and internal, is ongoing. Within the complexity of schedules, task lists and general life clamor, there is an enduring yearning for the uncomplicated. Being selective is helpful when our senses become overwhelmed and numbed, when too much is before us or in us. Likewise, when creating or viewing art, what is excluded or included matters. 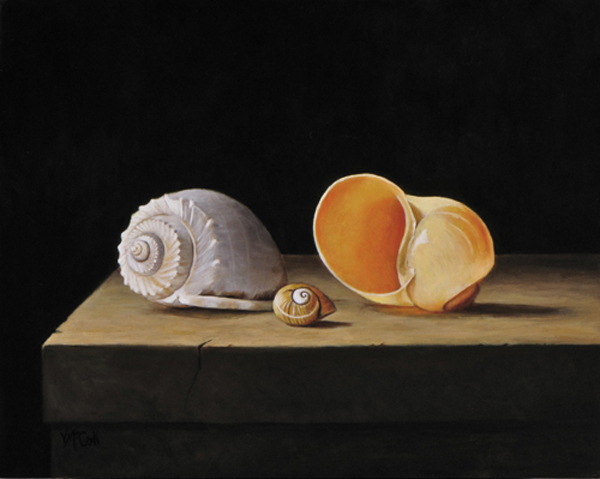 In the painting Three Shells on Stone Table, my goal was to create a private, quiet space to take in the elegant beauty of three lone seashells in the light. The simple subject and the precise details draw us to the painting. The focused light magnetizes the image further, pulling us in. Paradoxically, it takes effort to rest. As viewers of art, once we do what is necessary to shut the door on external noise, we may then encounter internal clutter which also must be pushed aside for a time. Of course, as individuals, we bring our own associations and preferences to the viewing experience, but we benefit by looking and listening as neutrally as possible. C.S. Lewis wrote: “The first demand any work of art makes upon us is surrender. Look. Listen. Receive. Get yourself out of the way. (There is no good asking first whether the work before you deserves such a surrender, for until you have surrendered you cannot possibly find out. )” Wise advice. This painting invites you to stop for a moment and come in - to be nourished by the simplicity of the scene and the tranquil beauty of the shells. Your painting reminds me of the Dutch vanitas paintings but without the still life clutter. Our lives mirror the frail existence of the shell, but unlike the decaying flesh of humanity, the shell is immortalized on the shore (and in your still life) long after its host is gone. The small shell between the two larger shells reminds the viewer that we belong to something bigger than ourselves, as the blackened background engulfs all ephemera in the abyss of the universe. Thank you for sharing this wonderful piece and for inspiring me today! Without WordPress I’ll bet I would not have encountered a nature enthusiast poet with art history/criticism background. I’m looking forward to exploring your blog. What fun this is connecting with so many people from all walks of life. Ah yes, simplicity is the quest.. the more frenetic life outside gets, the stronger the quest. Your painting is a beautiful example of quiet peace. Thank you for sharing it. Wonderful words from CS Lewis! Thank you, Linda! Yes, Lewis is the best. I’ve just discovered a classic book which deals in part with the “quest” – “Gift from the Sea” by Anne M. Linbergh. (includes her quote in my post). I’m only about a third through it, but am really enjoying it especially as it relates to women’s challenges to handle all life demands and do art. Your fiber art is brilliant…so fluid, bright and full of life. Just lovely. Vickie..you are awesome and your work is magic!